Relator describes your attitude toward your relationships. In simple terms, the Relator theme pulls you toward people you already know. You do not necessarily shy away from meeting new people -- in fact, you may have other themes that cause you to enjoy the thrill of turning strangers into friends -- but you do derive a great deal of pleasure and strength from being around your close friends. You are comfortable with intimacy. Once the initial connection has been made, you deliberately encourage a deepening of the relationship. You want to understand their feelings, their goals, their fears, and their dreams; and you want them to understand yours. You know that this kind of closeness implies a certain amount of risk -- you might be taken advantage of -- but you are willing to accept that risk. For you a relationship has value only if it is genuine. And the only way to know that is to entrust yourself to the other person. The more you share with each other, the more you risk together. The more you risk together, the more each of you proves your caring is genuine. These are your steps toward real friendship, and you take them willingly. Find a workplace in which friendships are encouraged. You will not do well in an overly formal organization. In a job interview, ask about work styles and company culture. Deliberately learn as much as you can about the people that you meet. You like knowing about people, and other people like being known. In this way, you will be a catalyst for trusting relationships. Show people that you trust them and they will be more likely to trust others. You can be an important role model in this area. Let it be known that you are more interested in the character and personality of others than in their status or job title. This is one of your strengths and can serve as model for others. Let your caring show. For example, find people in your company to mentor, or help your colleagues to know each other better, or extend your relationships "beyond the office." No matter how busy you are, stay in contact with your friends. They are your fuel. Be honest with your friends. True caring means helping the other person be successful and fulfilled. Thus, giving honest feedback or encouraging your friend to move out of a role in which he or she is struggling is a caring act. Forgive a close friend. When someone lets you down, you take it seriously, and might become skittish about renewing the relationship. Honor this reluctance, but don't let it stop you from extending trust again. 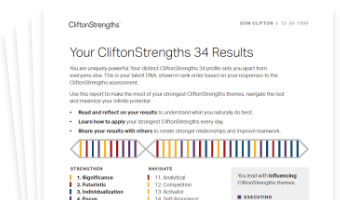 See how Relator shows in your CliftonStrengths results -- discover All 34 CliftonStrengths Themes today!